" The Friendly City "
As of the census of 2000, there were 3,186 people, 1,192 households, and 890 families residing in the city. The population density was 421.3/km² (1,092.1/mi²). There were 1,288 housing units at an average density of 170.3/km² (441.5/mi²). The racial makeup of the city was 89.08% White, 7.16% African American, 0.56% Native American, 1.32% Asian, 0.06% Pacific Islander, 0.63% from other races, and 1.19% from two or more races. Hispanic or Latino of any race were 2.54% of the population. In the city, the population was spread out with 27.9% under the age of 18, 8.6% from 18 to 24, 29.2% from 25 to 44, 22.3% from 45 to 64, and 12.0% who were 65 years of age or older. The median age was 36 years. For every 100 females, there were 93.2 males. For every 100 females age 18 and over, there were 88.2 males. The median income for a household in the city was $40,403, and the median income for a family was $42,665. Males had a median income of $29,375 versus $19,951 for females. The per capita income for the city was $16,400. About 8.1% of families and 10.2% of the population were below the poverty line, including 14.0% of those under age 18 and 3.0% of those age 65 or over. as of 2018 population is around 6,000 as the villages have built hundreds of new homes . Fruitland Park antedates the American Civil War, although the name of the town only came later, as it was originally called Gardenia. The earliest settler was M. Calvin Lee, of the Evander Lee family of Leesburg, who planted a citrus grove. After the war, a son-in-law of the Lee family, P.S. Bouknight, homesteaded 40 acres (160,000 m2) near Mirror Lake. In 1875, the State of Florida sent Captain Kendricks to the northern part of the United States to talk about the advantages of living in Florida. Due to Major Orlando P. Rooks' poor health, and already considering a move, he had his wife, Josephine, moved to Fruitland Park. They built their first home on Crystal Lake in 1877. It was here that the first white child, Frederic, was born in 1882. The Fruitland Nurseries of Augusta, Georgia, was owned by J. P. Berckmann, friend of Major Rook. Major Rook named the town Fruitland Park for the nurseries, and the main street Berckmann Street for this friend. The postal authorities refused to recognize the name Fruitland Park as there was already a Fruitland in the state. At their request, the name was changed to Gardenia in 1884. The Florida Railroad, put through the town just prior to this, had listed the town as Fruitland Park in all their printed matter and refused to recognize the new name of Gardenia. Consequently, all freight and express had to be directed to Fruitland Park and all mail addressed to Gardenia. This caused a great deal of confusion, which lasted from 1884 to 1888, when a petition was sent to the postal authorities to have the name changed back to Fruitland Park. The petition was granted in 1888. On December 20, 1884, Rev. G.W. Butler organized the first "community" church in Fruitland Park. The church had acquired lots on College Ave., between Fountain St. and Lime St. The church was built in 1886-1887. That building burned in 1934, but was rebuilt in 1935. That building was later sold to the United Pentecostal Church and still remains today. 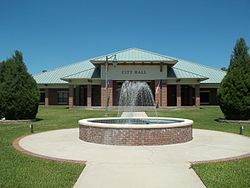 Fruitland Park was granted a Charter by the state on May 25, 1927. Today the city boasts churches, schools, and numerous businesses. It still calls itself "Hometown USA." Fruitland Park is also home to the oldest Dirt Kart Track in America. The 1/6 mile clay oval has hosted Saturday Night Dirt Kart Racing for Go Kart enthusiasts since opening in 1956. ^ a b "Population Estimates". 2008 Population Estimates. United States Census Bureau. July 1, 2009. Archived from the original (CSV) on July 7, 2009. Retrieved July 24, 2009. ^ "Villages closes $8 million deal on Fruitland Park property". Villages-News. December 10, 2013. Retrieved April 28, 2015. This page was last edited on 28 December 2018, at 20:27 (UTC).